I was a user of PDFCamp 32 Bit for several years to run our customer charts. In the older version I could set the printer up to automatically append to the back of the file I was creating. In the 64 Bit version...I am have to tell the program manual to append each page as it generates. Is there a way that this can be automated? Thanks for your message, yes, in the 64bit version of PDFcamp Printer, when you print a Word DOC, Excel XLS, HTML or other documents to PDFcamp Printer, a prompt message box will appear to ask you to choose appending or inserting to an existing PDF file, you need manual to choose appending or inserting buttons. 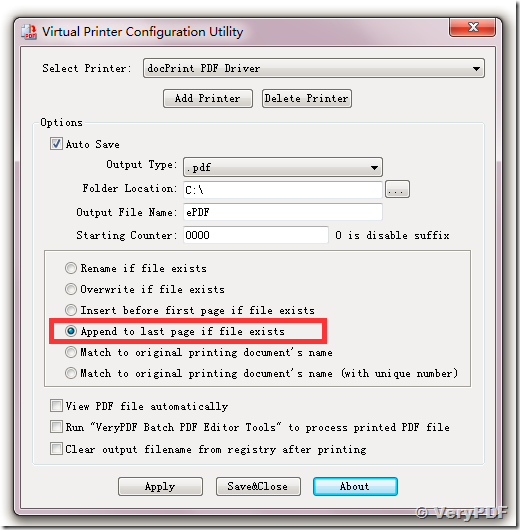 After you choose “Append to last page if file exists” option in “Virtual Printer Configuration Utility” dialog, you can batch print documents to PDFcamp Printer, the printing documents will be insert to the existing PDF file automatically. How to use CCITT Group4 compression for the black and white image streams in PDF Printer? 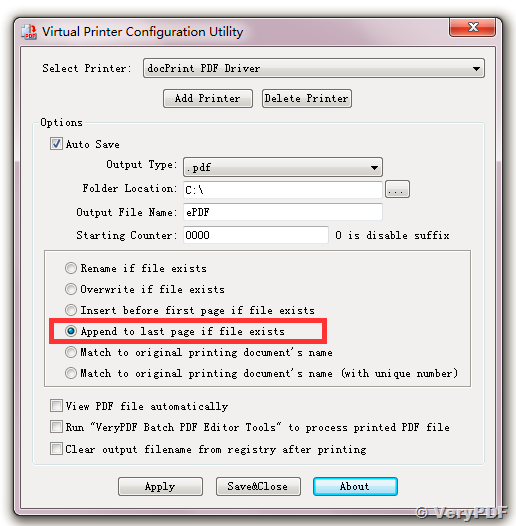 How do I register VeryPDF PDFcamp Printer? Can you show me step by step? How can I email generated PDF file silently via SMTP protocol? This entry was posted in PDFcamp Printer and tagged append pdf, append PDF pages, PDFcamp Printer. Bookmark the permalink.